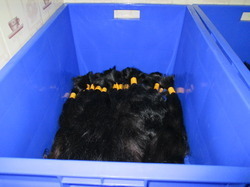 Our range of bleached remy hair has finest finishing and soft touch. Each hair has amazing look and enhance the look of the wearer. We provide these bleached remy hair in variant length and shades. 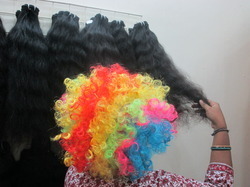 Indian Real Hair supplied by Royal Enterprises is highly demanded in many countries for their versatility & thick look. The texture of this product is uniquely fabricated and adaptable for wavy or straight look. We have a team of experts, who checks & approves the quality of this hair after being handpicked from temples. We assure 100% human hair of the finest quality that remains thick & naturally wavy even after wash. Indian Human Hair is ideal to make wigs, hair braiding, weavings & extensions. From the house of leading exporters of hair products, we bring Colored Remy Hair using 100% human hair of finest quality. These hairs are machine weft that gives deep wavy texture ideally used for straight & curly hairstyles. Our products are hygienic, safe to use as we hand pick human hair from temples and process them under international quality standards. Our clients can avail these hairs in array of colors, style and length as per their choice. We export Remy Single Drawn Machine Weft to more than 30 countries. Looking for Bleached Remy Hair ?